I haven’t posted a recipe here for a while, but Abby made this over the weekend, and I just had to share. 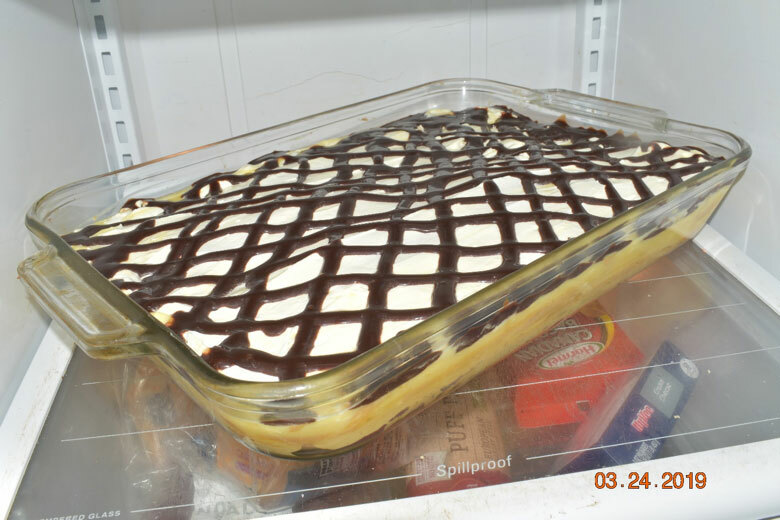 It is a Larson family favorite, and oh-so-easy to make. The only drawback is that you make it in an 11×15 inch pan, which you then have to refrigerate. And when you buy 8 gallons of milk at a time, refrigerator space is a precious commodity. Abby solved that problem by waiting until we only had two gallons of milk left. Mix 1 cup water and ½ cup butter in a sauce pan and bring it to a boil. Dump in 1 cup of flour all at once. (This part is really cool.) When the mixture forms a ball, remove it from heat and cool briefly. Then add 4 eggs, one at a time, and beat well. Spread this mixture into an ungreased 11×15 inch pan. When the crust is cool, spread the pudding mixture on top. Then spread the Cool Whip on top of the pudding mix. Then drizzle with Hershey’s chocolate syrup. It was very good Abby!!! My kids and I loved it!